Walk on stage in front of the public with your doll, you might be the winner of the contest! 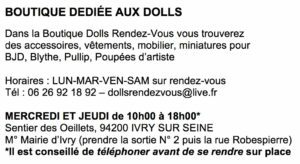 Dress up and send three photos of your complete outfit, as well as that of your doll, before 15 November to dollsrendezvous@live.fr. Specify: Your name, nickname, email address, cell number. Photos should be of high quality in order to appreciate all the details of your outfit (JPEG, 880×590 pixels). These elements can be used at any time and any place. If you do not agree that your information be published, please let us know in writing. If the candidate who created his outfit, as well as that of his BJD, does not wish to walk on stage, he will have the possibility to be replaced by a person wearing his creation. Each candidate will walk on stage. At the end of the fashion show, the jury will meet to elect the winner and, thereafter, will announce it to the public. A gift, courtesy of one of our partners, will be awarded to the Contest winner. Further details of the Prize will be announced later. Please note that the prize will not be sent, it must be recovered on-site by the winner.